Sugar-Free Pink Applesauce, or, I Have No Impulse Control and It’s Fun! Autumn is my favorite season, misfits…HANDS DOWN. What does that mean, anyway, “hands down”? Wouldn’t “hands up” imply more excitement, a la your Bad Mama Genny raises her hands in the air and waves them around in the manner of having nary a care? But I digress. Anyhoo, this crisp, clean fall air always makes me want to do one thing: sign a fetus over to Satan a la Rosemary’s Baby. Oh, wait, that’s not right. This crisp, clean fall air always makes me want to do one thing: apple picking. Probably some hangup from childhood, when I was raised by wolves and used to sleep in an apple tree so they wouldn’t accidentally tear me to pieces while dreaming about chasing bunnies. Am I kidding or am I not, the world may never know. But whatever my reason, there’s one thing that’s crystal clear to everybody: I will insist on picking in ridiculous quantities and any attempt to moderate my behavior will cause me to have a massive, dramatic, and scene-making seizure and then die in the naysayer’s arms. Or maybe what happens is slightly less severe than that, but never you mind your pretty little heads about such details. So The Boy and I spent a clear, luscious Sunday at the orchard climbing, lugging, juggling, falling over, causing ruckuses, and carefully considering how to maximize our bushel. After loading our goods into the trunk (and just barely passing bag overfill inspection by some extremely scrupulous farmers who gave my fishnets a skeptical eye), we plotsed ourselves down onto a bench in a sunny spot of the orchard. 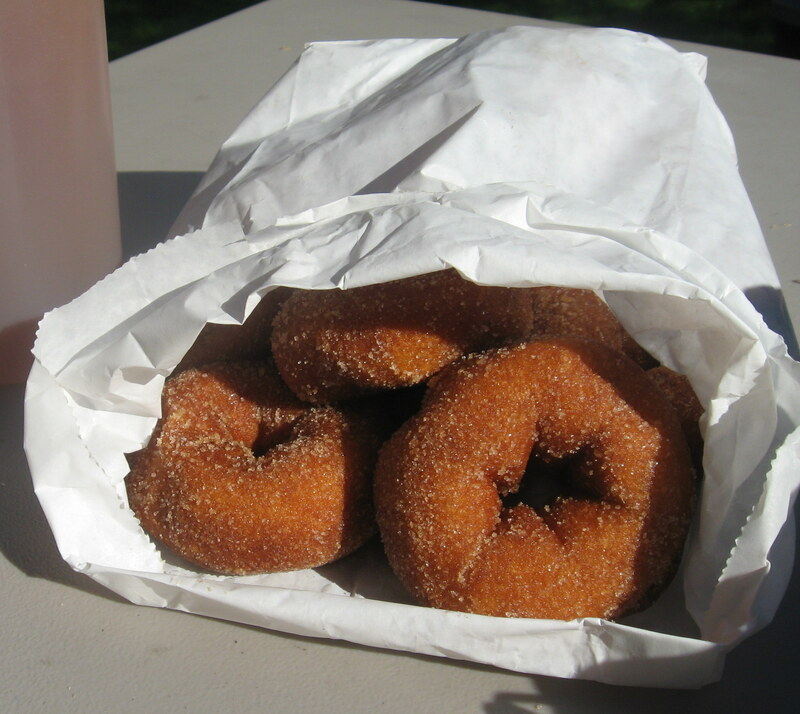 The two of us shared a cool pint of homemade cider and a few hot, fluffy apple cider doughnuts, fresh from the fryer. These babies were fall personified. If donuts were persons. Fine, they were fall donuttified. Unexpected bonus: never had we inspired such fear and suspicion in our fellow New Yorkers as when they saw us approaching with our bushel of shiny new produce. “Hark, it is the pale ones,” they said to themselves. Or at least, that’s what I imagine they said–pedestrians passing by readily offered their comments, but they were rarely in English. Of course, The Boy disagrees–he feels nothing but shame at what he assumes those landscapers were saying about his apples between enthusiastic whistles. 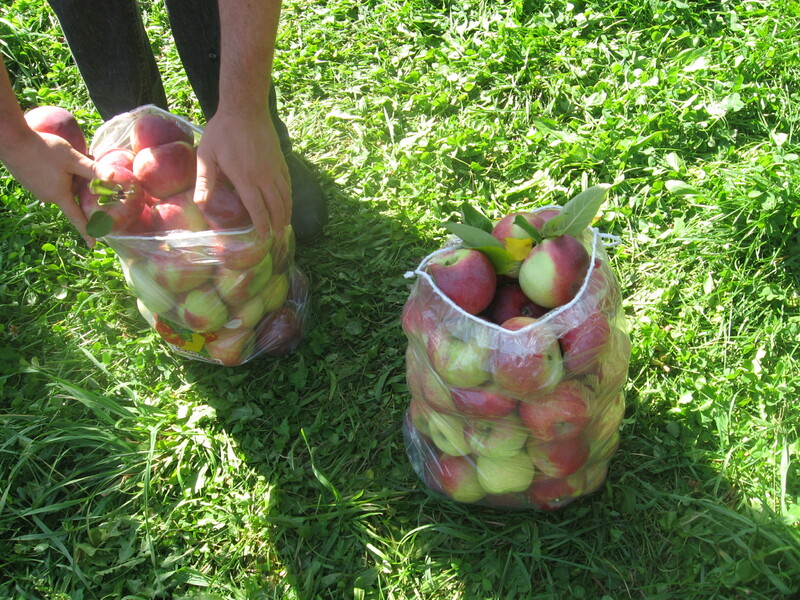 And so, having had the full reality of just how many apples we’d picked graciously driven home by our neighbors, I set to work making room in the refrigerator and brainstorming some applications. Applesauce it was–but not the pale, sugary mess in a jar you might be used to seeing on store shelves. These apples didn’t need any sweetener at all. They were sweet enough already. They were well-behaved and chaste and good and OH JUST EVERYTHING THAT YOU AND I ARE NOT. In fact, if you use a sweet, red, thin-skinned apple variety that’s been grown without sprays, you won’t even need to peel them. This’ll get ya’ a gorgeous pink applesauce that just screams “misfit.” You barely need a recipe for this, dudes and dudettes, and it’s perfect for freezing in batches, serving with crisp potato latkes and a brisket, using in recipes, or just enjoying as is. So what did we do with the rest of the apples? A few are still taking up valuable refrigerator real estate, but some went toward a batch of Apple-Cherry Oatmeal Bars, others we’ve enjoyed as-is, and the rest went to two gallons of from-scratch Hard Apple Cider. What, you thought I had enough shame not to drag moonshine into this? HARDLY! So did our excess of apples teach me a lesson about letting fall fever cloud my judgment? Absolutely–if I could do it all over again, I’d pick twice as many. Then I wouldn’t be making a trip back to upstate New York tomorrow for another bushel. Wash the apples thoroughly; then quarter and core them. Put enough water into a large pot (think Dutch Oven size) pot to cover the bottom by 1/2 inch, and add your apples. 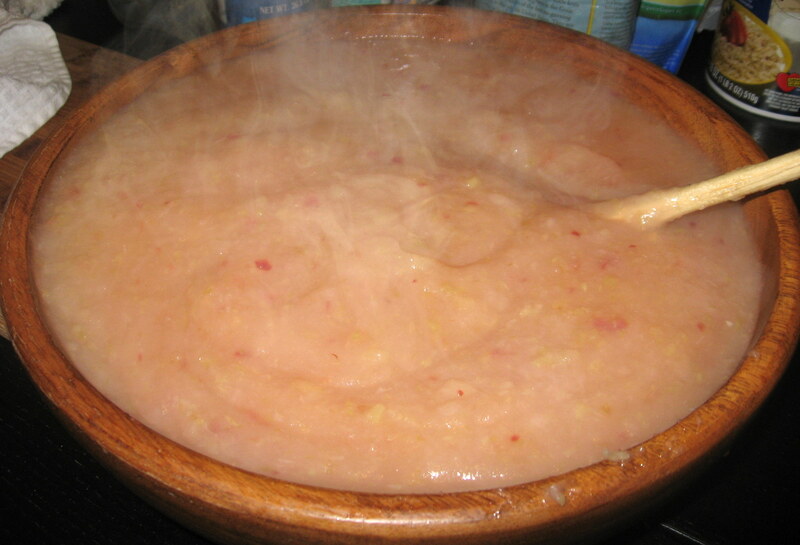 Put a medium-high flame under the pot and occasionally stir up from the bottom to redistribute the apples. Cook until the apples are very soft, about 20 minutes, adding more water to prevent scorching as necessary. Allow the mixture to cool enough to safely handle, and then run it through the food processor until the skin is only visible as tiny red flecks in the sauce (You can also put it through a food mill, if you’re bitchin’ enough to have a food mill; I’m currently slightly less bitchin’ than that, but still bitchin’ enough to make pink applesauce which is STILL ALL KINDS OF BITCHIN’ SO RESERVE JUDGMENT MMKAY?). Cool the applesauce completely, divide it into containers, and refrigerate or freeze.